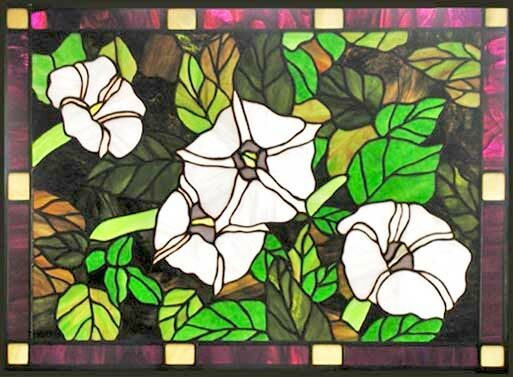 "BELLADONNA" FLOWERS STAINED GLASS WINDOW CUSTOM GLASS DESIGN CREATED BY JACK McCOY©. This stained glass window was 24 ½" x 18 ½". This is a memorial window for a very close friend of Jack’s wife who passed away. They are Belladonna flowers or Moon lilies as they are sometimes called. They only bloom at night. Copper foil construction.